Occasionally a project comes to Kickstarter that, for whatever reason, grabs the imagination – it far exceeds its funding goal and is set to become a sure thing well before the pledge period is over. 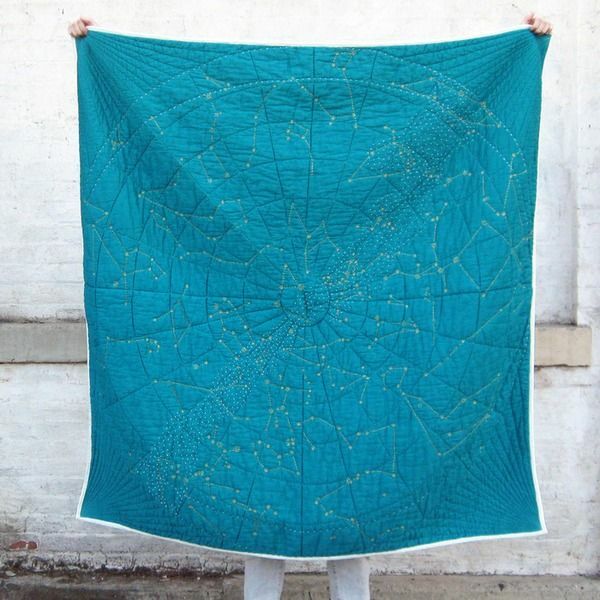 The magnificent Constellation Quilt is one such project. Designed by the Haptic Lab in New York, a studio that creates beautiful things that explore the sense of touch, the Constellation Quilt lets you touch the night sky. 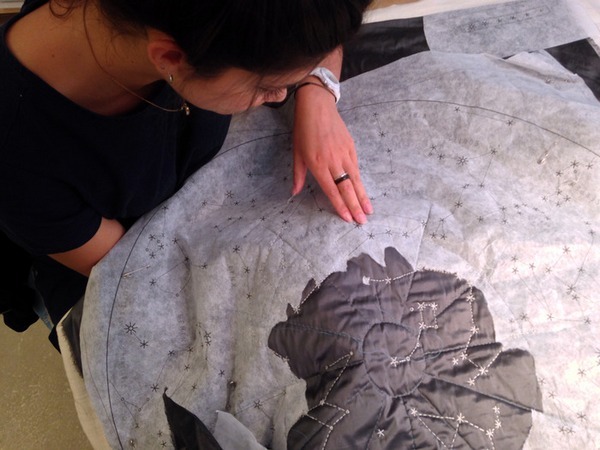 Using traditional quilting and embroidery techniques, the Constellation Quilt shows the October night sky in the Northern Hemisphere and includes constellations such as the Big and Little Dipper, Gemini, Orion, Leo, and Taurus. Each star is embroidered in metallic gold thread and the vivid turquoise night sky is complete with a Milky Way of tiny French knots that provide a tactile field sweeping diagonally across the quilt. 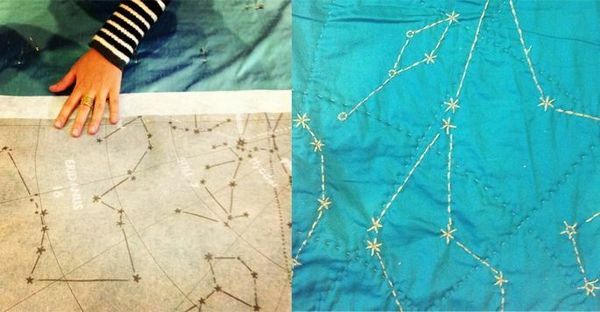 At the time of writing this post, almost all the opportunities to back the project and be the first to get a quilt were gone , though there were plenty of pledges still available for a DIY guide to making your own Constellation Quilt (shown below). A US$45 pledge buys you a DIY kit complete with a single use map template of your choice of the Northern or Southern Hemisphere night sky and instructions for completing your own quilt. 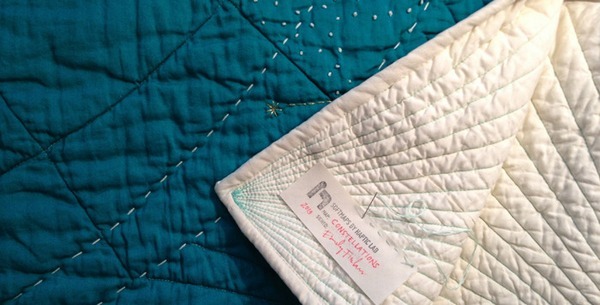 The Constellation Quilt Kickstarter project ends on June 10, 2013. 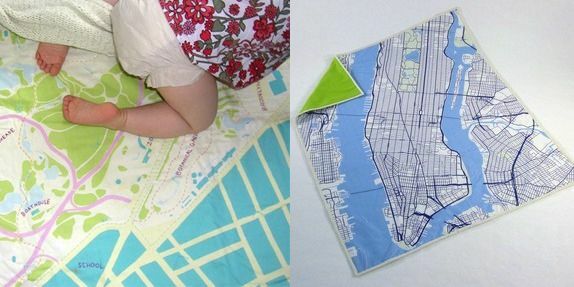 Make sure you take a look at the other quilts created by Haptic Lab, including their gorgeous baby quilts in a range of maps of major US cities as well as London and Paris. The baby quilts are priced at US$145 and would make a special (and useful) keepsake.